Lesson VI-7: Searching For Buried Treasure Anything you find with your own metal detector is fair game. Say, that safe behind the crying Elvis. Each island contains multiple decoy treasure chests, and exactly one real one. Decoy chests may be small (covering a 1x1 region) or large (covering a 2x2 region). Each island may have any number of decoy chests of either size. No part of a decoy chest may be buried under a palm tree. Each square adjacent to more than one decoy chest is marked with a palm tree. No other squares contain palm trees. 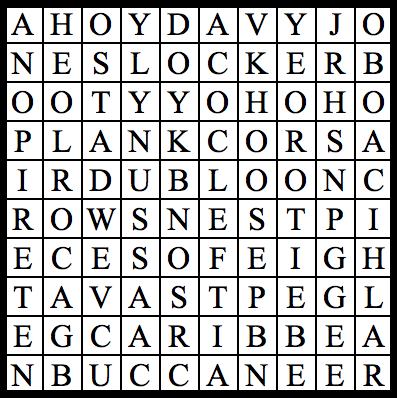 Each row or column that contains more than one decoy chest is marked with a skull & crossbones. No other rows or columns contain skull & crossbones. Once the decoy chests have been unearthed, the real treasure chests can be found. Real chests don't follow the rules for decoy chests; rather, the following (and only the following) is true about them. Each real treasure chest is small. A real treasure chest never appears in the same row or column as a small decoy chest on its island. A real treasure chest is never adjacent to a large decoy chest on its island.